CCS's Amos Davenport drives through the lane for a lay up. Chattanooga Christian coach Eddie Salter knew that his Chargers would be in for a battle when they went to Boyd-Buchanan Tuesday night for a key region basketball game. The challenge got even bigger when CCS big man Michael Houge went down in the first minute of the second quarter with an ankle injury and didn't return. The Chargers missed their big man after he had scored nine of their 13 points in the opening quarter, but they more than made up for his absence with a stirring 54-47 victory in front of a near-capacity crowd at Tom Jett Gymnasium. CCS improves to 17-3 with their 14th straight win. They stay in first place in region play with a perfect 9-0 mark. The Bucs fall to 18-6 overall as a three-game win streak gets snapped. The Bucs are now 8-2 in region play with both losses to CCS. “We knew it would be a battle and it was, but it always is when we play Boyd-Buchanan,” said Salter following the game. “It really hurt us when Mike went down as he’s our bread and butter and a workhorse in the paint. He does a great job and is hard to stop, but we put in some younger kids to take his place and they did okay. “We had a nice lead at the half, but we knew that those guys would start hitting some shots. We just had to hang in there and not lose our composure. It was one of those tough games down the stretch, but they finally missed a few and we were able to get some key rebounds. “I was really pleased with our defense as they kept us in it. We need to go back to the drawing board with our offense as we struggled on that end, but Boyd has some really good players and they are a team to be reckoned with. We’re just fortunate to come out with a win tonight,” Salter added. Boyd-Buchanan coach Josh Templeton never lost confidence in his kids, even when the Chargers extended a 13-11 lead after one quarter to 30-20 at intermission. “If you make one mistake against a team like Chattanooga Christian, they bust you. If you miss a shot, they will make you pay. Even though we trailed at the half, I fully expected our guys to come out and give everything they had. We aren’t going down soft,” he said following the game. “You’ve got to give CCS a lot of credit. Coach Salter put some lineups out there that were hard to guard and they made some big shots. Our kids stepped up and made some big shots too, but we gave up 10 or 12 points on offensive rebounds and that will get you against a good team. “I hated to see their big man get hurt, but they have a bunch of good players. Amos Davenport has a knack for sticking a dagger in your heart. I’ll be so glad when he graduates and I told him that. But we’re still getting better every day. I’m sure we’ll be better tomorrow than today as a result of this game, but we’re going to try to pull off a Muhammad Ali in the tournament and shock the world. “But I’m really proud of these as they just keep battling,” Templeton concluded. 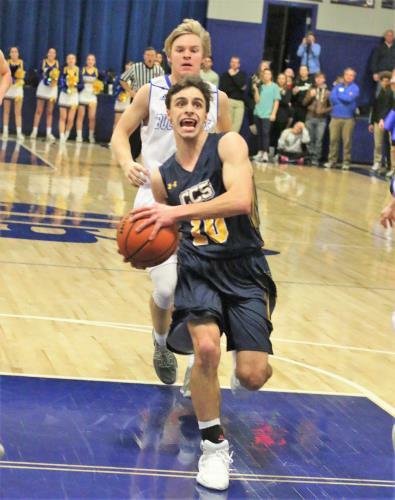 Houge helped the Chargers build that first-quarter lead while six different CCS players scored in the second as CCS stretched the difference to 10 at the break. The Bucs scored the first seven points in the opening two minutes of of the third quarter only to see CCS respond with seven straight points of its own. The Bucs then took a 39-37 lead with a 12-0 run in the last two minutes, sparked by 10 points from Ian Johnson. Eli Evans scored Boyd’s first five points in the final stanza to give his team a 44-41 lead with 5:32 to play, but another 3 from Johnson at the three-minute mark was the only other points the Bucs could score as CCS finished the game on a 13-3 run. Johnson’s 3 knotted the score at 47-47 before Davenport put his team ahead with a 3. He put a little icing on the cake with a pair of free throws with 25.2 seconds left while Grant Van Meter’s two charity tosses at the end made the final difference seven points. Davenport was the only CCS player in double figures as he finished with 14 points. Van Meter and Houge followed with nine apiece whgile Treveon Scott had eight and John Rhodes six. Johnson sank five 3s and led the Bucs with 19 points. Evans followed with 15. CCS also had an unofficial 26-22 advantage in rebounds. Mondo Ellison led the Chargers with seven while Jackson Hilger and Houge both had four apiece. Will Emrey had seven caroms for the Bucs while Evans snagged six. CCS GIRLS 55, BOYD-BUCHANAN 30: The Lady Chargers only led by eight at halftime, but the second half was the difference as CCS enjoyed a 26-9 advantage to pull away. Kate Dirkse and Madison Blevins scored 14 and 13 points, respectively, to lead CCS while Addie Henry added 10. Zacori Hill was tops for the Lady Bucs with eight. CCS (55) – Mary Vandergriff, Madison Vandergriff 2, Blevins 13, Henry 10, Davick 1, Ross 2, Zidan 2, Ricketts 2, Walker 1, Reid, Youell, Dirkse 14, Rolleston, Lowe 8. BOYD-BUCHANAN (30) – Reeves, A. Taylor 2, Stone 3, Tramel 2, Gardenhire 4, M. Taylor 4, Balthrop, Nguyen, Dawson 2, Baxter, Garner 5, Hill 8. 3-POINT GOALS: CCS 5 (Blevins 3, Lowe 2); Boyd-Buchanan none. CCS (54) – Davenport 14, Rhodes 6, Van Meter 9, Ellison 4, Houge 9, Hilger 4, Tre. Scott 8, Young, Tra. Scott. BOYD-BUCHANAN (47) – Evans 15, Oliver, Edmondson, Emrey 6, Covington 7, C. Johnson, I. Johnson 19, Baubach, Gay. 3-POINT GOALS: CCS 3 (Davenport 2, Van Meter); Boyd-Buchanan 6 (Evans, I. Johnson 5).